Metabolic pathways disrupted in PH: the Warburg effect. 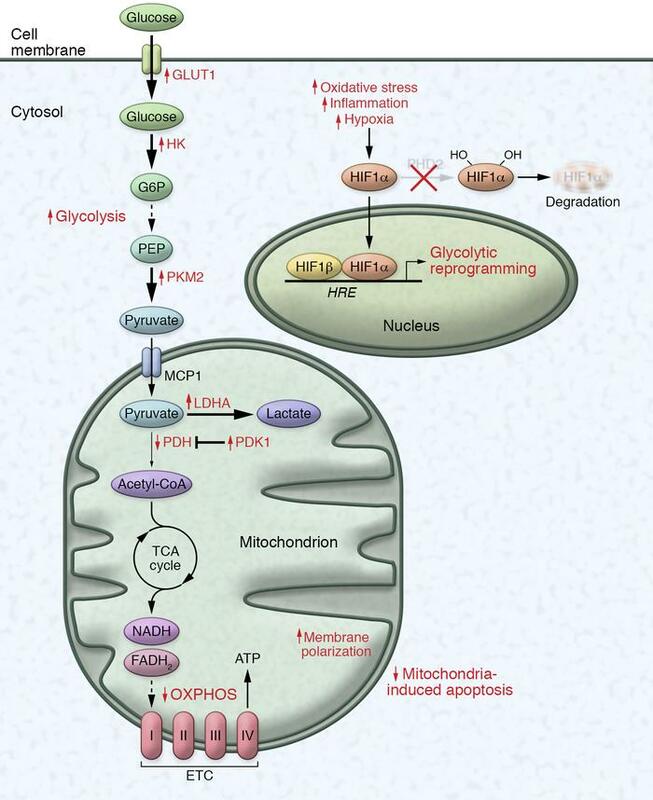 The mitochondria in pulmonary vascular cells and the right ventricle in PH exhibit decreased oxidative phosphorylation and increased glycolysis, consistent with the Warburg effect. Following a decrease of respiratory activity, transcriptional upregulation and stabilization of HIF-α mediates compensatory glycolytic reprogramming, which includes increased glucose transporter 1 (GLUT1); hexokinase (HK), which traps glucose via conversion to glucose-6-phosphate (G6P); and lactate dehydrogenase (LDHA), which converts pyruvate to lactic acid. At the same time, there is increased activity of pyruvate kinase isoform M2 (PKM2), which slows the production of pyruvate from phosphoenolpyruvate (PEP), and reduced pyruvate dehydrogenase (PDH) activity, driven by elevated pyruvate dehydrogenase kinase (PDK1/2). The Warburg effect promotes cell survival and proliferation, and simultaneous hyperpolarization of the mitochondrial membrane potential promotes evasion of mitochondria-dependent apoptosis. This metabolic switch in pulmonary vascular cells drives extensive remodeling that further results in increased pulmonary vascular resistance and pulmonary artery pressures. ETC, electron transport chain; HRE, hypoxia-response element.